A day retreat supporting you in your yoga and meditation practice. A regular yoga and meditation practice benefit people in many ways, including helping with depression and anxiety. It can help to give clarity and calmness of mind. Allows more focus and creativity, improves physical health and more restorative sleep, to name a few. This day with Matt and Ann is designed to guide and support you in your practice. The day will be held in silence - no phones, no chat. This can be jarring for people in today's connected world, but it's a powerful support for meditative insight. 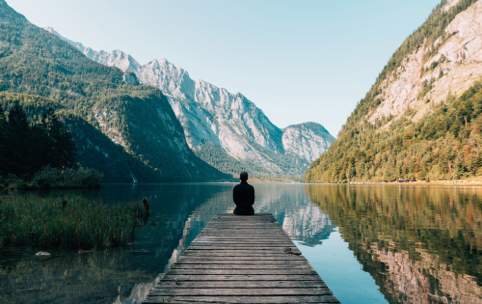 Temporarily setting aside communication allows us to develop powerful mental stillness and clarity which is otherwise much harder to achieve, and it's this stillness and clarity which opens the door to the deepest and most transformative insights. We’ll use techniques drawn from Zen and early Buddhism, combined with the grounded, embodied practice of yoga, we will explore the Three Characteristics of existence: impermanence (anicca), non-self (anatta) and unsatisfactoriness (dukkha). Deep insight into these fundamental aspects of all conditioned experience triggers and cultivates the process of awakening, or enlightenment. The day will be held in silence (apart from instruction, guided meditation and questions), including lunch. Please bring a packed lunch to eat at the studio. Mobile phones must be kept off all day, so please make arrangements accordingly. Silence breaks at the end of the day for final Q+A, tea and biscuits. I have been practising meditation and mindfulness for ten years. My experience includes both the Zen tradition (currently studying under Daizan Roshi with Zenways, and prior to that with the Western Chan Fellowship) and also a range of other approaches to practice (particularly working with Leigh Brasington, studying jhana and insight practices from early Buddhism). I have benefitted profoundly in my own life from these practices, and believe passionately in sharing them with others for the benefit of all. Ann found yoga in 2003 with a rigorous Ashtanga practice, loving the physical challenge of this style. As life placed different demands on her and her yoga, she reached out to other styles to meet her changing needs. Her teaching is now influenced by a broad range of styles, from invigorating Dynamic Vinyasa Flow to calmer Hatha and restful Yin Yoga. Ann is drawn to Buddhist philosophy, regularly attending silent retreats. Her classes incorporate both invigorating asana work with slower paced meditative time, working from the outside in. Ann has been teaching since 2013; she completed the 200 hour yoga teacher diploma at Yogacampus London, and is registered with the Yoga Alliance. She has also trained in Yin Yoga with Norman Blair at Zolder Studios in London. She’s currently undertaking her 500 hour advanced teacher training with Ian Davis.